Brett Swenson, Standards of Measurement, 1 Liter (detail), 2016. Erlenmeyer flask, obsidian, heat, borosilicate glass shelf. H 10, W 10, D 9 inches. courtesy: norte maar. "Paracosm" is a technical term for an imaginary world. The most famous examples are literary, like J.R.R. Tolkein's Middle Earth or C.S. Lewis's Narnia; but in the visual arts, narrative works are often set in manufactured worlds. In an independently organized exhibition in Brooklyn, New York, the work of six experimental artists has been organized into “Paracosm: new worlds in glass,” which showcases the capacity of glass art to provide a transporting experience in a wide range of works, all with a conceptual foundation. Brooklyn’s Norte Maar, a nonprofit focused on “connecting emerging artistic communities and uniting cultural forces to foster artistic expression and raise the imaginative energy in us all,” is the setting for this fanciful exhibition, which runs through October 23, 2016. 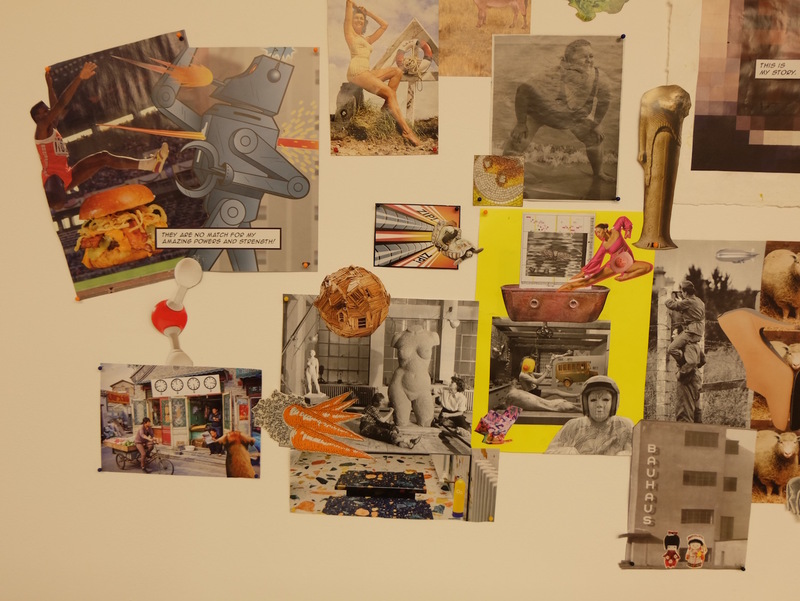 Guest curators Erin O’Connor and Suzanne Peck “wanted to choose a topic that conveyed whimsy and imagination,” O’Connor told the GLASS Quarterly Hot Sheet in a telephone interview, and paracosms seemed the perfect way to encapsulate this. Both are deeply fascinated by the history and philosophy of alchemy, which is evident in their curatorial choices. O’Connor explained this allure as “the promise made, by fire, of transformation, if not transubstantiation,” that is found in both the archaic science and the creative worlds of glass. Alchemical imagination is most directly viewed in Brett Swenson’s Standards of Measurement, 1 Liter, a beaker of laboratory glass that has been deformed by the expansion of volcanic glass, obsidian, inside of it. The result is a strangely organic-looking object, its innards bursting out of itself, calling to mind the “myth of the furnace as uterus,” as the curators say in their exhibition notes. As an alchemical experiment of natural and man-made glass' response to heat, it allows us to “bear witness to the animative qualities of glass,” as O’Connor says. A similar empirical investigation led to one key component in Erica Rosenfeld’s magical installation, Like Remembering a Dream the Day After, Part III: citrus burnt in an annealer. A mountain of the charred limes and lemons surround a small illuminated bunny seated atop a blown-glass hill. And, above the fantastical landscape, a richly-textured glass cloud is mounted on the wall. 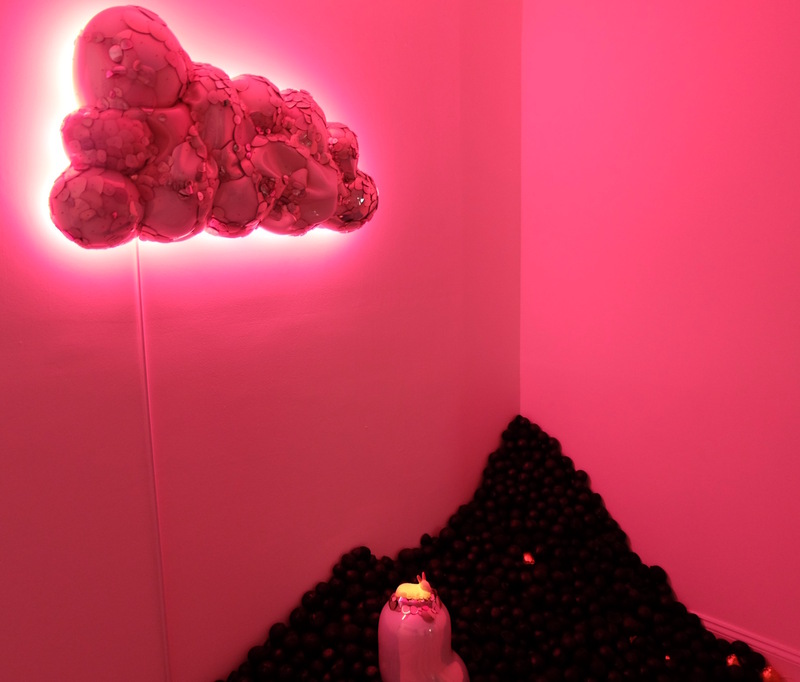 Pink neon light emanating from behind the cloud creates an aura that connects the whole scene, giving the installation a singular gestalt. It is a spellbinding expression of dream-logic, a true paracosm of silica and lime. 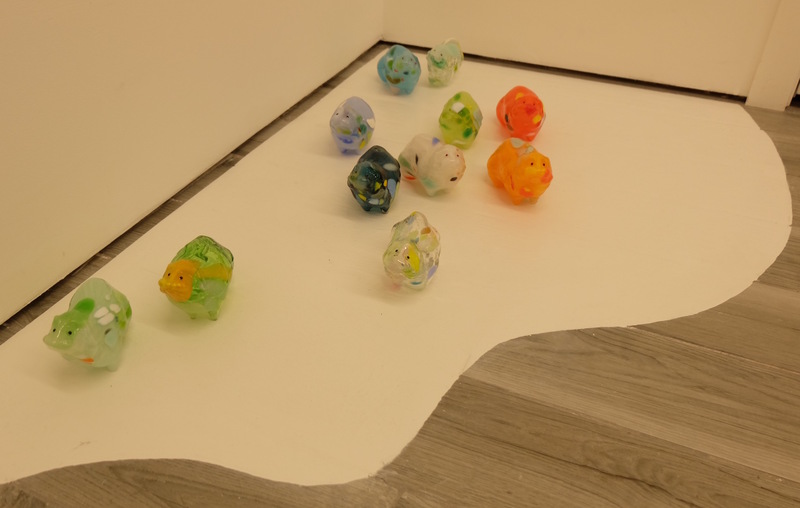 Color and whimsy are also found in Swedish artist, Frida Fjellman’s General Exodus, where a herd of multicolored glass lemmings appear to rush innocently towards a cliff. O’Connor suggests this “invites us into a kind of madness,” and the juxtaposition of the lemmings’ light-hearted appearance against the darkness of the apparent narrative certainly belies a kind of crazed humor. But humor reaches its peak within the exhibit in the work of Benjamin Wright, whose Terry Gilliam-esque collages offer what O’Connor calls a “semiotic paracosm.” Wright’s intuitive ability to juxtapose cultural symbols works to great effect in American Piehole — cutouts of Japanese dolls stand in front of the iconic Bauhaus at Dessau, and a cartoon robot faces off with an Olympic athlete hurdling over a giant cheeseburger. His Micro Fictions crystallize these postmodern bricolages (here made of Japanese trash) within large “drops” of glass. 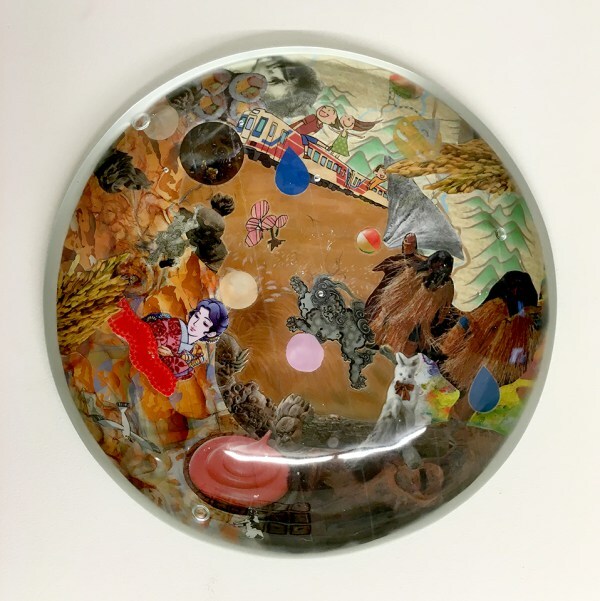 Each work has a distinct flavor of cleverly appropriated images, reinterpreted into ensembles which feel surprisingly cohesive in their glass enclosure — like pieces of pop-culture in a visual candy dish. The final two artists offer primarily conceptual works. 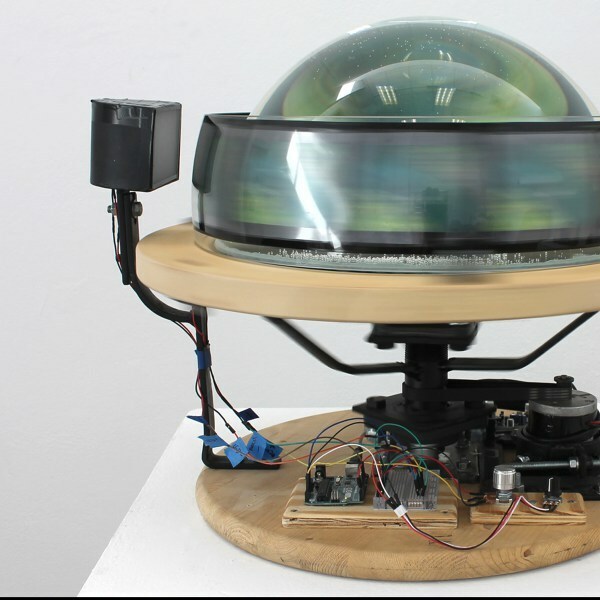 David King’s Sisypuss displays an internet GIF through the 19th-century mechanism of a glass zoetrope, exploring our impulse towards imaginary worlds both contemporary and historical. 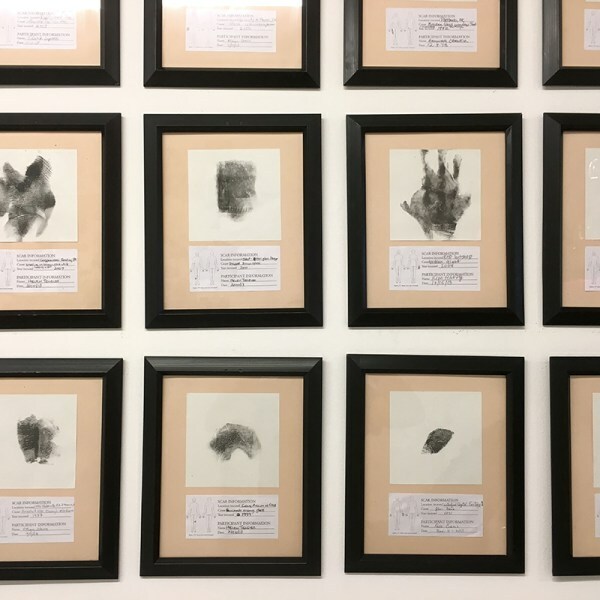 And Kim Harty’s Visceral Topographies (Glass Collection) consists of monoprints of scars artists have received from glass, turning the real-life effects of the material into the art and estranging us from the intended creative object. While King's machine is a beautiful object, and Harty's project an interesting one, the works prioritize pure idea, perhaps to a fault. O’Connor said that she and Peck wanted works which “played with the seductive quality of glass,” and the best works in “Paracosm” do just this. While that captivating presence is missing from some of the show's more conceptual pieces, the works which harness it shine brightly enough to be truly transporting. In the last anaylsis, fire’s promise of transformation appears to be alive and well. 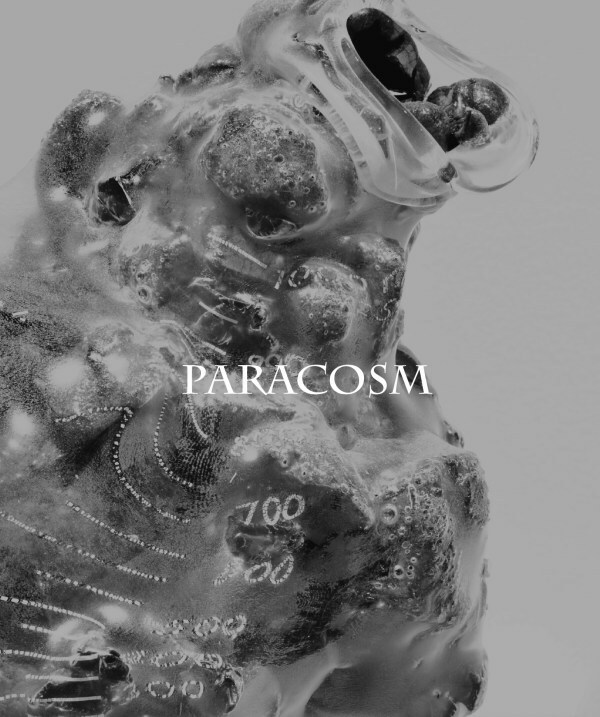 "Paracosm: new worlds in glass"